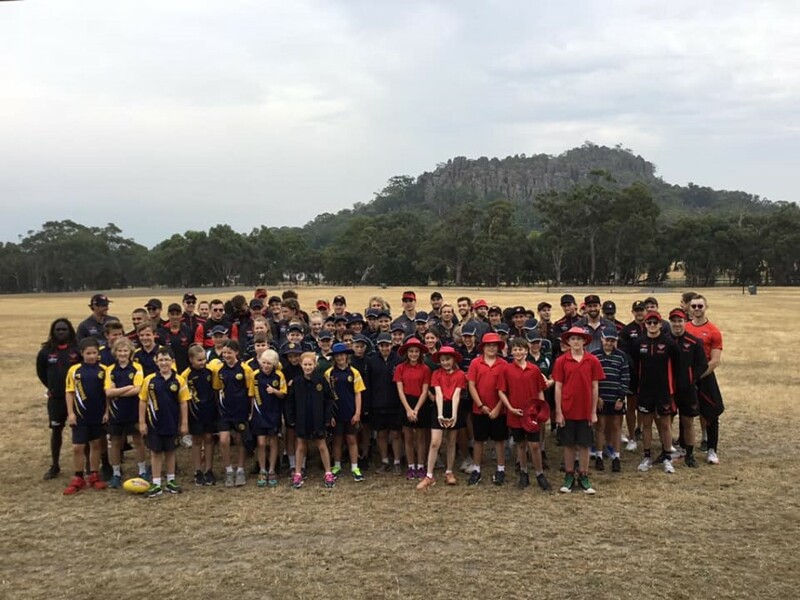 Hundreds of young school children had the chance to catch up with Essendon's finest from the field as they came to local footy clubs and Hanging Rock (pictured) to mix with the kids, run them through training sessions and dish out inspiration by the bucket load. The Macedon Ranges were invaded by Bombers last week – Bombers of the football variety that is. 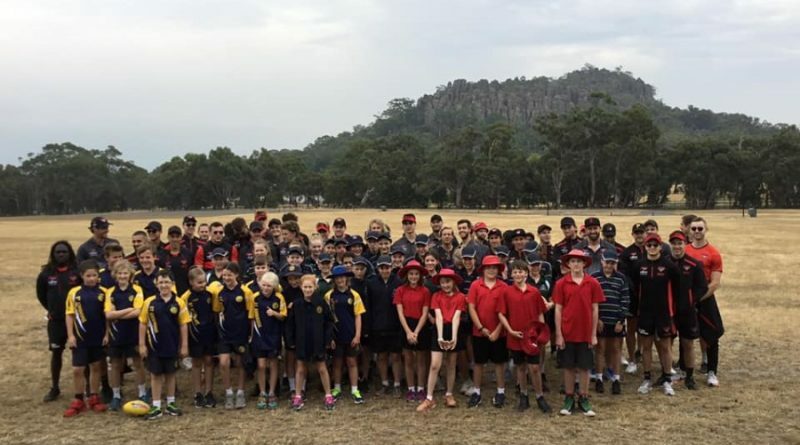 Hundreds of young school children had the chance to catch up with Essendon’s finest from the field as they came to local footy clubs and Hanging Rock (pictured) to mix with the kids, run them through training sessions and dish out inspiration by the bucket load. At Kyneton alone 125 junior Tigers went though a training session on Monday afternoon and the same happened at Woodend-Hesket with that club’s enthusiastic juniors. Kyneton also hosted more that 200 grades one and two students from local schools and scores of kids gathered at Hanging Rock in the east paddock to go through their footy paces with the Bombers. Then on Monday evening it was time for the ‘big kids’ to catch up with the Essendon footballers when Kyneton Football Netabll Club hosted a fundraising dinner at the Shamrock Hotel for the Kyneton Tigers with the entire playing group and coaches from Essendon FC, as well as 40 local Essendon supporters. Essendon’s Dyson Heppel and Orazio Fantasia were among a few of the players interviewed on a panel by Kyneton vice-president Rob Waters – which was very entertaining – and players signed autographs and had photos taken with fans. 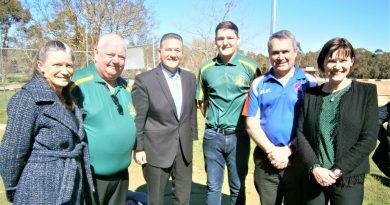 “It was great for the club and the town to host the Essendon football players and coaches,” KFNC Pesident Karen O’Sullivan said. 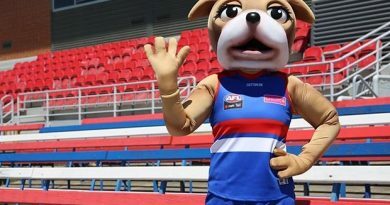 “They were very generous with their time and made an effort to explore the town, ate at the local pubs and tasted coffee from our cafes,” she said. 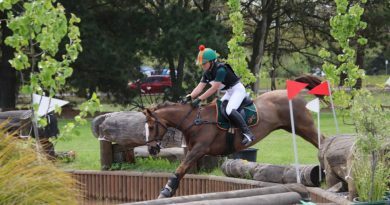 Many riders who'll compete next Sunday will be seeking qualification for state-level events.